Q From William Chepulis: In an online photo-sharing group of which I’m a member, someone posted a scan of a calotype print titled Redding the Line. Some members of the group think that redding refers to the application of a red colorant to the surface of something. Or does it instead mean making repairs? 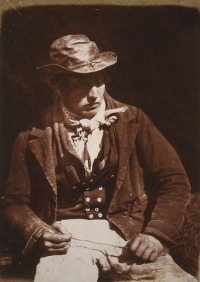 A The photograph is a famous early one, a member of a series taken by Robert Adamson and David Octavius Hill in 1844, using the system invented by William Henry Fox Talbot only a few years earlier. It’s in the collection of the National Galleries of Scotland. It was taken in Newhaven, then a fishing village a mile to the north of Edinburgh on the estuary of the river Forth but now part of the city of Edinburgh. It shows a young fisherman named Willie Liston holding a length of fishing line. Redding the Line was the title given to it by the photographers. As both Hill and Adamson were Scots, we must look to the Scottish vernacular to find the answer. The verb is redd, one also known in northern Ireland and parts of northern England. It has nothing to do with colour. Instead, it has had a variety of senses — to clear or clean out, clear away, put in order or make tidy, put things right, and, specifically, to disentangle yarn or fishing line. It’s not clear from the picture exactly what young Liston was doing — perhaps not very much in view of the long exposures needed to make a calotype — but “disentangle” fits best. Many Americans will also know, or know of, redd up, to mean clear up, associated in particular with Pennsylvania. This is also common in Scotland — a particular example is Da Voar Redd-up, the Spring Clean-up, an annual event in Shetland to remove litter or rubbish from public spaces. Where redd comes from isn’t clear. Its history is mixed up with two other verbs. One is rede, meaning to clear land, put in order, clean up or tidy; the other is rid, to make free of something, which is of Scandinavian origin. It’s very likely that their senses became intermingled and inextricably tangled as time went on. Last modified: 19 December 2009.